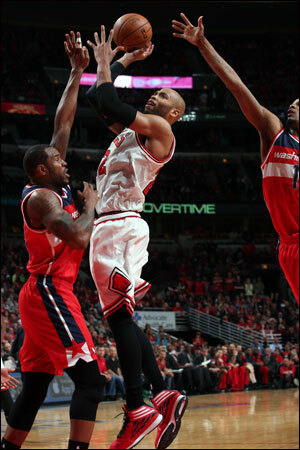 No more Bulls home court advantage with Washington’s 102-93 victory in Game 1 of the playoffs Sunday! Outplayed down the stretch and outrebounded! Again! 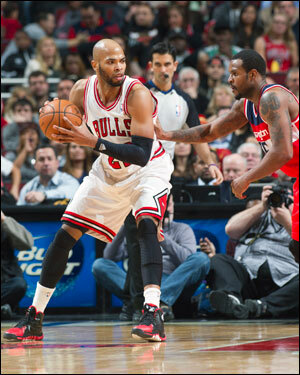 If Nene means baby, the Bulls need a bigger pacifier! I’m not even close to being out of exclamation points! There’s this view that the Bulls got to the conference finals on that last day of the regular season as they avoided the first round matchup with Brooklyn and saw Miami into the opposite bracket. And the Pacers already trail the Atlanta Hawks 1-0. Just four games from the Finals? It’s a tired cliché to match sports teams with the images of their cities. As blue collar as Chicago likes to consider itself, it’s one of the great finance capitals of the world. And as sophisticated as Washington would like to be, there are as many working peoples’ areas as in Chicago. So did we go another year just for Heat-Spurs II? Or can Oklahoma City finally break through now that they are about to have the league MVP? Or has Houston made the offseason acquisition with Dwight Howard that will be the difference? If the Bulls could have dreamed up the pairings for the NBA playoffs starting this weekend, it likely would have come out something like it has with the Bulls opening at home Sunday against the Washington Wizards.